Huge selection of professionally recorded sound effects. within 30 days and we will re-credit you. 5 free sound effects each week in your free user account. Royalty-Free use in all your media productions, forever. More discount the more credits you buy - up to 40% off everything! Standard WAV files, CD-quality or higher. Read more on our info page and in our blog . As the end of the year is drawing close and we're coming up to the third Christmas season since 1SoundFX.com went live in 2009, I thought I'd write a few words about "the sounds of Christmas", to get us into that festive spirit. What are the sounds of Christmas? What sounds do you imagine when you're thinking about Christmas shopping, Christmas eve, Christmas day and perhaps Christmas cooking? For starters, I guess the "most Christmas" of all sound effects, are the sounds of Sleigh bells. We actually have lots and lots of them, not just this one. Just type sleigh bells into the search box on our site and click "Go". This very characteristic sound originates from horse drawn sleigh rides in the winter. "Oh what fun it is to ride in a one horse open sleigh". My second most Christmas related sound would have to be the classical Santa Ho Ho Ho sound. We actually have several variations of this as well, just search for "ho ho", or "santa" and you'll get lots of options -- with or without the "Merry Christmas!" at the end. Another Christmas related sound is the sound of church bells ringing. It sets the mood for Christmas Day and Christmas mass. To find church bell sounds on our site, you can either type church bell or church bells into the search box, or go to our subcategory: "Other, Misc Sound FX" -> "Church bells". I guess the final sound that I personally connect with Christmas is the sound of Christmas shopping; in other words, the sound of a shopping mall crowd. Busy people hurrying this way and that to buy presents for friends and family, hopefully not in the last few minutes before shops close on Christmas eve. Traditional Christmas music: Favorites such as Auld Lang Syne, Jingle Bells, Joy to the World, O Come All Ye Faithful, God Rest Ye Merry Gentlemen, Silent Night, The First Noel, Good King Wenceslas, O Christmas Tree, Oh Holy Christmas and many more. Choir sings Christmas hymns: Beautiful recordings of a choir singing christian Christmas hymns, such as Where E'r You Walk, Händel's Messiah, Parry's Jerusalem, Jubilate Deo, Once in Royal David City, As With Gladness Men of Old, Vivaldi's Gloria, and many others. Vocal Christmas music: Here you'll find vocal versions of classics such as Joy to the World, Silent Night, Jingle Bells, O Come All Ye Faithful, Angels We Have Heard On High and others, as well as new / contemporary pop, rock and singer/songwriter music with a Christmas sound or theme. New and Fun Christmas music: Finally, in this category we'll find Christmas music for people who are tired of the old classics. Here you'll find instrumental Christmas type music that are new, original compositions where you won't recognize the actual tune, but the sound and flavor of the music is Christmas inspired. 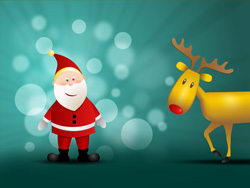 We hope you've enjoyed this little walkthrough of Xmas related sounds and music, all royalty-free, available for you to license and download immediately, courtesy of our two sites, 1SoundFX.com and Shockwave-Sound.com. Thanks for reading... and one more thing: Merry Christmas!